It seems that most new firearms are coming equipped with an accessory rail for lights and/or laser sights. Tactical lights appeal to the gear-head in us all. They have a really high coolness factor. But what are the issues, benefits and drawbacks of these systems? Is the light on the gun an asset or is it just a bad guy target acquisition indicator? The light helps you to identify your target, but it also shows the target where you are. Is it more important to be able to positively ID your target or to keep your position concealed? Or, is a separate flashlight not mounted on the gun a better arrangement? Of equal importance are the legal implications of using a weapon-mounted light. Once the light is mounted on a firearm, it becomes part of the firearm, and pointing it at another human being can be a crime. Have you ever been in the kind of situation where some illumination could prevent a tragedy, like the kid next door coming home after the prom dead drunk and going to your house instead of his own and trying to get in, or a beloved family pet getting something caught on his collar, dragging it around in the basement and making sounds like a home invasion? In these types of situations, the time allowed for the shoot or no-shoot decision can be very short. Make the wrong decision and a tragedy or legal disaster can occur. Can the tactical light help here? Or put another way, what are the rights and wrongs of using a weapon-mounted light? One factor that quickly emerges in this discussion is the distinction between law enforcement and armed citizens. Law enforcement loves tactical lights. For the armed citizen, they can be a bit more problematic. The difference is in the mission. There are times when law enforcement (and military) must go on the offensive: they have to go into places and clear buildings. The role of the weapon system for the armed citizen is purely defensive. As a lone, armed citizen, you should never attempt a building clearing alone except in the most extraordinary circumstances. If you notice, when the professionals do that, they always do it in teams. 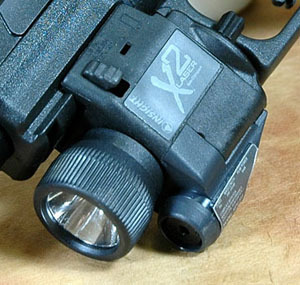 Doing it alone can be characterized as, “hunting for someone to shoot me.” Consequently, we have to put on the bifocals when dealing with tactical lights. They perform different roles depending on the mission and the person behind the gun. Police officers face two kinds of situations in which the tactical weapon-mounted light can literally be a life saver: dynamic entries and building clearing. During a dynamic entry, the ability to instantaneously identify threats and non-threats saves lives. In a building clearing situation, having the light mounted on the weapon allows for a free hand to open doors and move things while still maintaining the readiness of the weapon. Even in this context, law enforcement officers cannot put a weapon-mounted light on someone unless it is a situation which would justify pointing a gun at them. Actually, the same legal rules apply to LEO’s (Law Enforcement Officers) as apply to the armed citizen, but LEO’s do have a bit more latitude in this matter due to the nature of their job. But a LEO cannot threaten a person with a gun for no reason. (You notice I don’t use the term “civilian” when talking about citizens and law enforcement officers. The reason for that is that law enforcement officers are civilians also, although they don’t act like it sometimes. The only way to quit being a civilian is to join the armed forces. Once you are a soldier, seaman, airman or marine, you cease to be a civilian, but not before.) For the armed citizen, the issues are different. When polling my friends and correspondents, the consensus was, “It’s great for a ‘house gun’ but useless for concealed carry.” The problem of weapon-mounted lights for armed citizens is that they can encourage us to break the basic rules of gun handling: “Never cover with the muzzle anything you don’t intend to destroy,” and “Know your target.” Also, in some circumstances, pointing a gun at another human being can be a felony in itself unless it is justified by the circumstances. You can’t use the weapon light as a simple flashlight. You have to remember that it is part of the sighting system of the firearm. With those caveats said, there can be a role for the weapon-mounted light in the context of home defense. Everyone can imagine situations in which one might have to move through the dark and quickly identify targets and no-shoots. One thing that’s very clear is that the weapon-mounted light does not substitute for or replace a flashlight. If you had to choose one or the other, the flashlight would be the choice. It’s more flexible, less complicated legally, and can perform most of the functions of a weapon-mounted light. Don’t think for a minute that a weapon-mounted light will allow you to dispense with a flashlight because it won’t. The weapon-mounted light is most useful when you already know some information about the situation, particularly, that there is something very wrong happening and you will have to quickly determine shoots and no-shoots. A possum in the garage knocking over gas cans probably doesn’t qualify, but may get you a visit from local law enforcement inquiring as to why you’re running around the yard in your underwear with a gun at 3 A.M. When you are suffering a home invasion, and know there’s bad guys in your house, and also know that you don’t know the location of all of your family members, the weapon-mounted light could be a big help. As Walt pointed out, the range of applications for the tactical light is very limited, but within that narrow range, it could be extremely important. For LEO’s the value of the weapon-mounted light is clear and unambiguous. For the armed citizen, the use of the tactical light is more problematic, but the value is still there. I think some professional training in low-light combatives (by a responsible trainer with some real-world experience with an emphasis on the legal issues) would benefit any armed citizen who chooses to deploy a tactical light, just because there are some mistakes which can be made, and walking through the scenario with a professional critic can show you where the trapdoors are. Once I was awakened by noises in my basement at approximately 3 A.M. My house is a two story with a full basement. All of the family’s bedrooms are on the second floor and no one should have been in the basement at this time of night. I grabbed my 1911 and a Streamlight Scorpion flashlight and went downstairs as quietly as I could. As I reached the foot of the basement stairs, I could still hear movement in the far end of the basement. My heart was pounding, and I’m sure I was suffering an “adrenaline dump.” I didn’t do any fancy ninja gun/light hand positions. I just leaned around the corner, Streamlight high in my left hand, pistol with safety off at low-ready in my right. Surprise, surprise: it was my eldest son, then about 15, sleep-walking in the basement. He was disoriented and bumping into things. The learning that came out of this for me was that a good flashlight is essential for home defense, and is, in some ways, more important than the gun. Had I been using a gun-mounted light, I would have had no choice but to point the gun at or near my own child. The tactical gun-mounted light does not replace the flashlight. 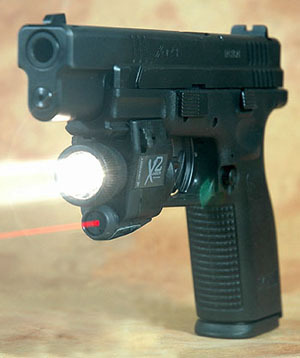 The gun-mounted tactical light has its role to play, especially in low-light situations in which the shoot/no-shoot decision must be made almost instantaneously, but the gun-mounted light also introduces its own set of safety and legal problems. It tempts us to break two of the cardinal rules of gun safety: “Know your target” and “Never cover anything with the muzzle that you do not intend to destroy.” And remember, boys and girls, that pointing a firearm at another human being without justifying circumstances is a felony in most jurisdictions. 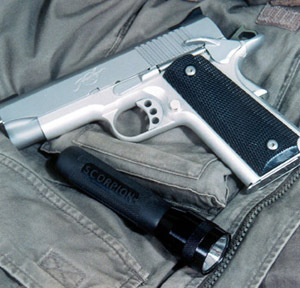 The gun mounted light may be a helpful addition to your personal defense system, but it does not replace the flashlight, and in many circumstances, the flashlight is far more useful and flexible.